Summary: A ride on the Embsay and Bolton Abbey Steam Railway followed by a walk from Bolton Abbey Station to Bolton Abbey Estate Country Park is one of most popular summer day family outings in the Wharfedale area between Harrogate and Skipton. It is a thrill for all, as it was for me when Lil when entertaining son, daughter in law and two and a bit year old granddaughter Molly on a lovely summer's day in 2015. Each one of us enjoyed the fantastic day out. 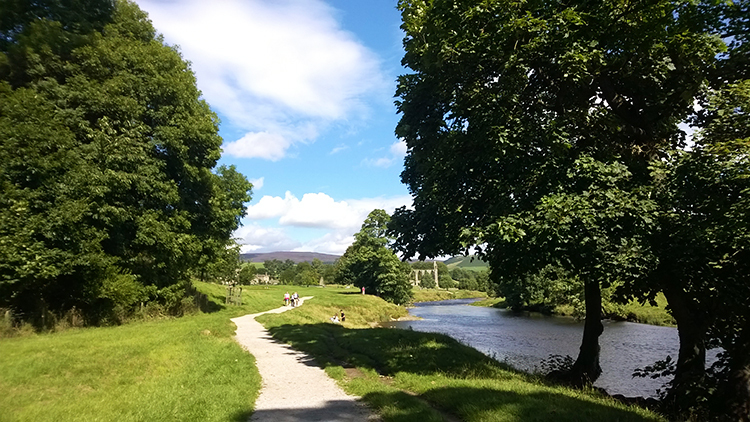 Who couldn't with a treat of a train ride followed by an easy walk to the splendid and pretty country park within Bolton Abbey Estate. The Walk: We all have to start somewhere. It was the Cod Beck area of the North York Moors near to the village of Osmotherley for me. Usually on a sunny Sunday in summer when my parents would pack the picnic and corral me, Dave and Ray for a five mile trip up to the moors from our home village. 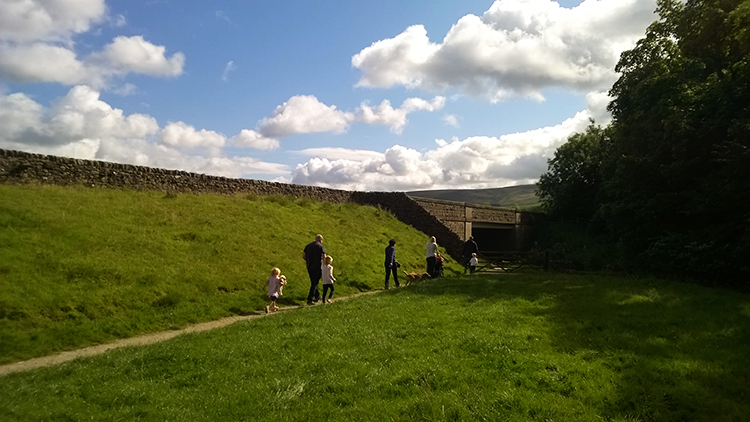 I still remember those wonderful times when mum and dad would set up the picnic beside the trickling waters of the beck and allow us to explore the near surroundings. Then my dad would take us on a short walk, exploring the mysterious moor. What adventure, what fun to walk and find out about these wild places for the first time. Now it was Molly's turn. 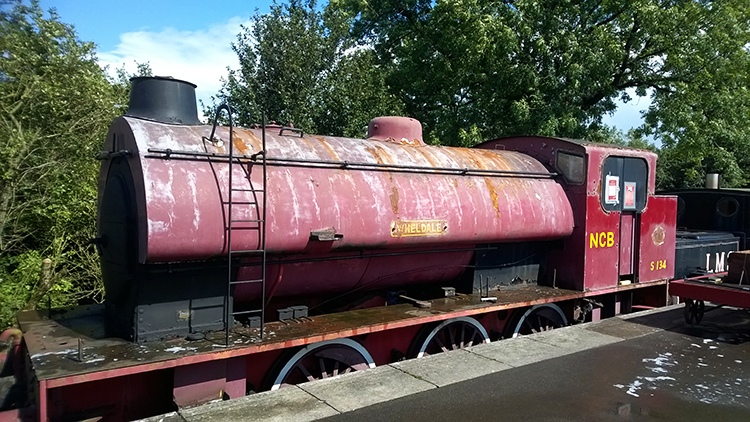 Molly was lucky, we preambled the walk with the fun of a steam train journey on the Embsay and Bolton Abbey Steam Railway. She had the added thrill of punching the tickets, thanks to the kind conductor on the train. After the excitement of the train journey we began the fun of the adventure walk. Like me, Molly was keen to get on and raced ahead while mum, dad and grandma walked on at a leisurely pace behind. Of course we had stop before getting too far ahead and wait for them to catch up. From the station we passed a short row of stone built terraced houses and crossed a field to reach the bridge which safely took us from the south side of the busy A59 road to the north side. Molly wanted to jump into the trickling waters of Hambleton Beck. I made sure she stayed dry. At only two and nearly a half years old Molly was doing extremely well, keenly keeping pace with Grumpops, as I am affectionately known. In fact she often raced ahead but I had to tether her back when we approached Bolton Bridge. I had her safely in hand as we walked beside the road and until we were safely in the open field of the strand walk approach into the estate. White fluffy clouds scooted across the sky but there was plenty of sunny intervals too. And it was warm. It was a perfect day. 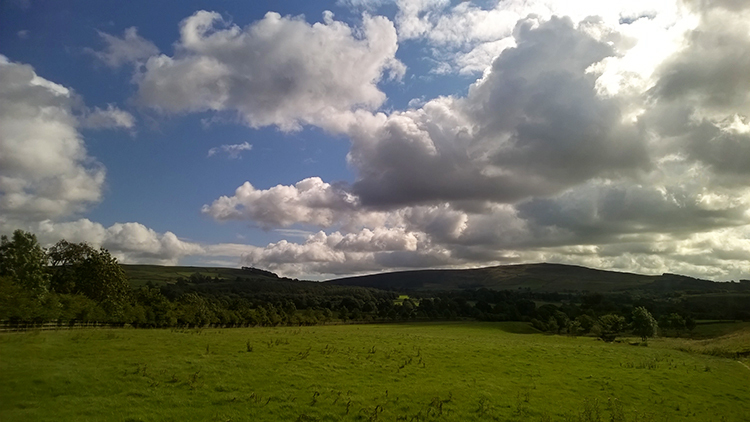 I looked across to Hazlewood Moor and to Barden Moor in the north where Simon's Seat waits. I thought "Maybe in a few year's time I will be able take Molly there. I hope so". We continued crossing the field, sometimes walking, sometimes racing for short sprints as young people finding their feet tend to do. It was all good fun. While we played and meandered across the field aimlessly the parents and grandma caught up. We headed into the Estate Country Park together though it was not long before Molly and I split off again. 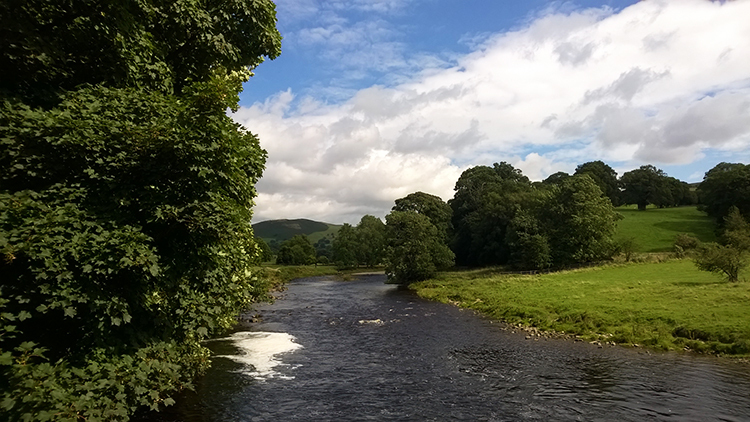 She wanted to play hide and seek in the group of trees edging beside the River Wharfe. I had to be her partner, keeping her hidden and safe at the same time while the seekers sought us out. If they couldn't do so then Molly helped them out with a suggestive "We're here!". No patience there then. 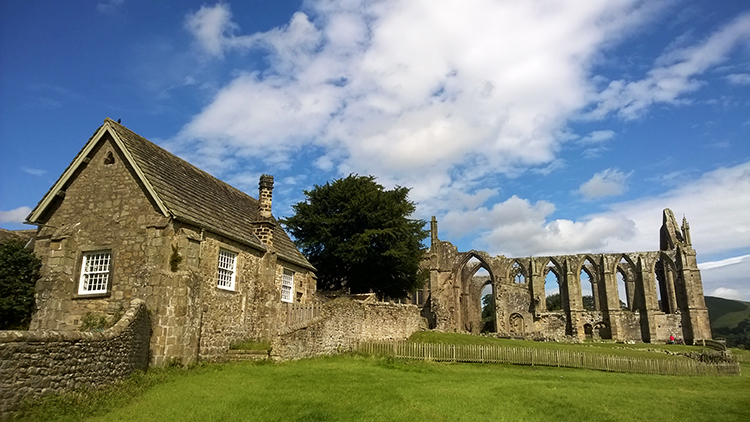 We continued on towards Bolton Priory and to the heart of the estate. 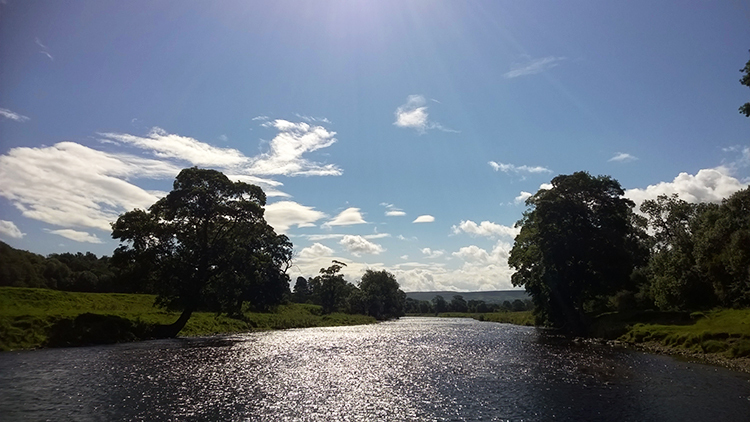 As we did so, walking northwards and staying close to the river it became clear this was the most popular of areas. Groups of people were congregated in various places. 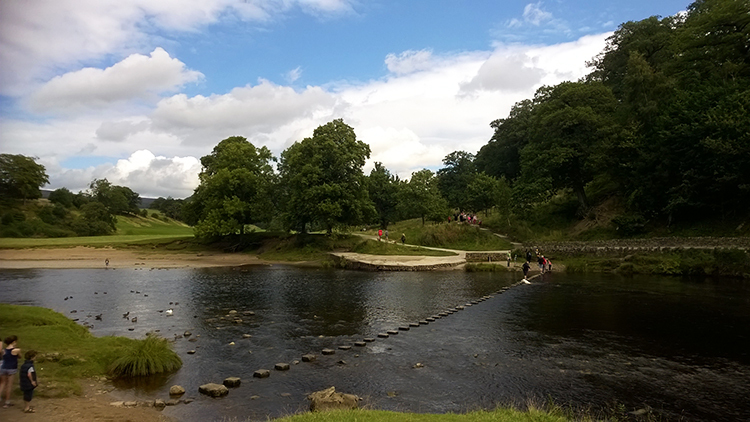 There was a constant line of people waiting to cross the river at a wide section of the Wharfe which is tamed by a weir and where a well maintained line of stepping stones straddle the river. I surmised it was the most used series of stepping stones I had ever seen beating those across the River Dove in the Peak District into second place. (By the way, there are 60 stones to negotiate on the river crossing). 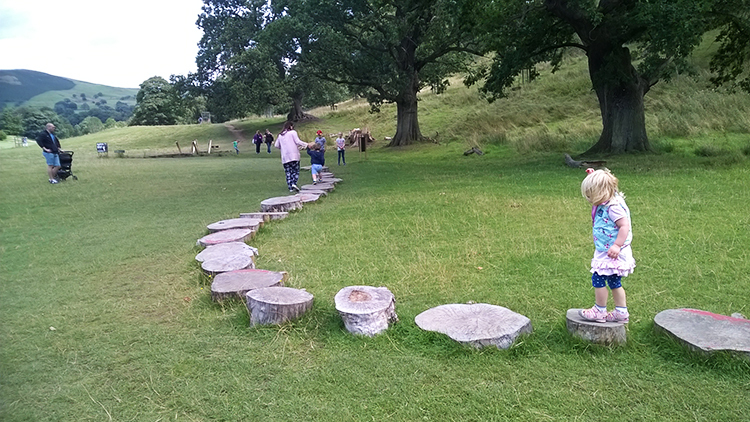 The most used stepping stones in Yorkshire? There were also plenty of people assembled on a sand and shingle beach just upstream of the stepping stones and on the east side of the river. 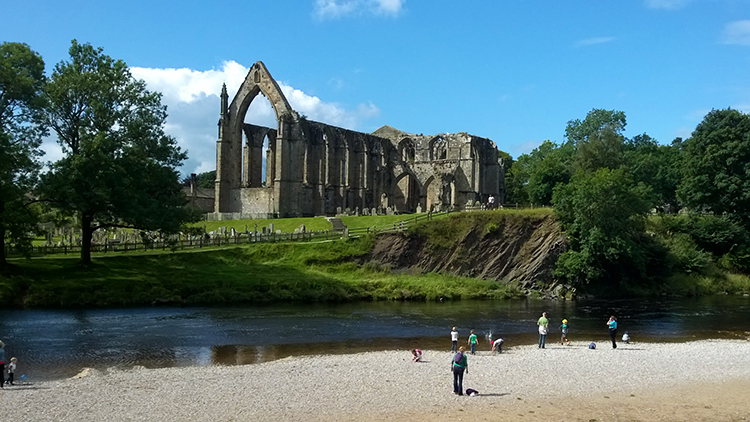 The setting of the beach, on a wide curve in the river provided the most wonderful landscape view of the priory ruins. The people on the sand and shingle beach were doing one of two things. Admiring the view or playing at the waters edge. Naturally the young ones were playing by the water. Not Molly though, she had spotted something else which took her fancy. There were a few activities for the young ones in the country park. One of them was a series of tree stumps set into the ground forming a snaking trail to follow. The trick was to walk along the full length of wooden steps without falling off and Molly the intrepid just had to try it out. There were around 30 steps in all and Molly did it unaided. Not bad for 30 months. WELL DONE. Of course she had to do it again. And again. Having mastered it first time I think so could have walked up and down that path for some time. Fortunately for mum, dad, grandma and grumpops there was an ice-cream van nearby which was used to entice her away. 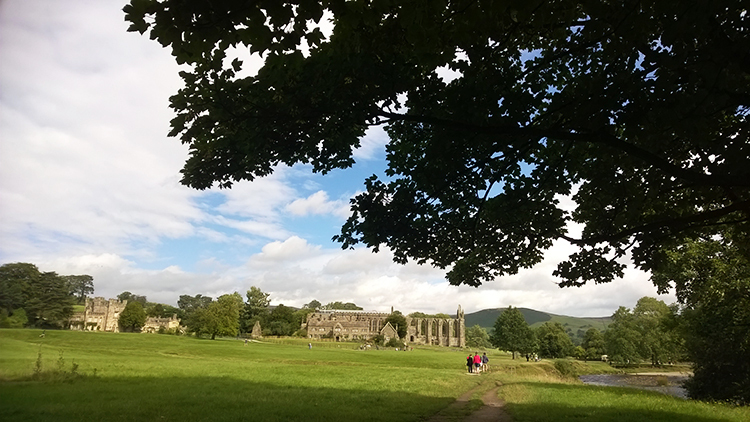 While everyone else in our family group enjoyed their ice creams and having turned one down for myself, I explored the ruins of Bolton Priory. 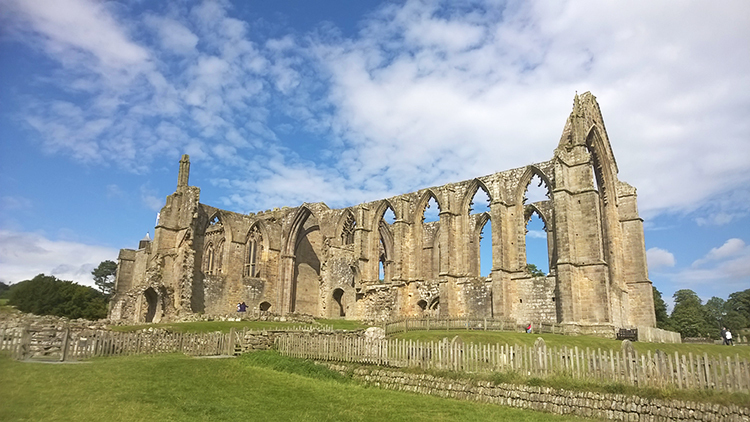 Of the Augustine Order, the priory was founded in the early 12th century and continued in religious existence until the Dissolution of the Monasteries resulted in the termination of the priory in January 1540. 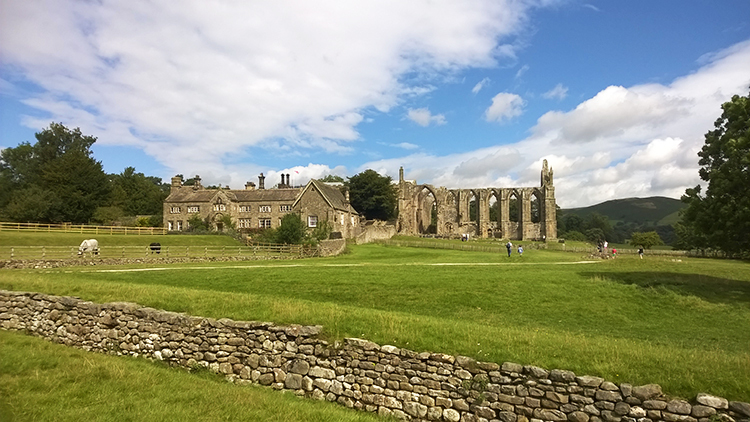 After my exploration of the priory and of the grounds which included an impressive cottage I rejoined the ice cream eaters who having finished started the amble back towards Bolton Abbey Station. We had a train to catch. During our time in the park, which was only a short half hour so we had lots of fun, but there is so much more to do. 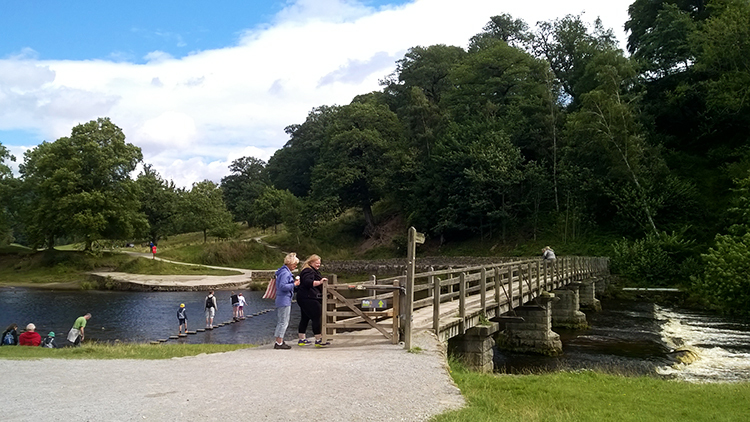 You could extend the day by following the river walk a little further to Cavendish Pavilion for lunch or a cafe break and of course a thrill a minute woodland walk to the famous Strid where the River Wharfe narrows dramatically. Alas, we did not have the time on this occasion. One to bank for later. 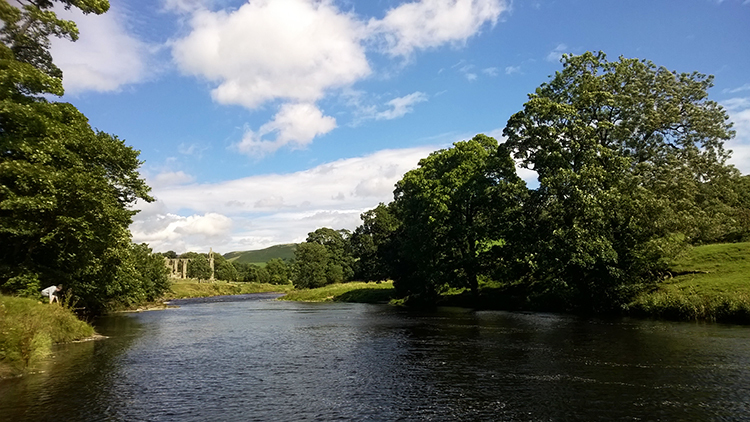 As I have mentioned, the Bolton Abbey Country Estate is perfect for a family day out, and this walk a perfect introduction to walking for the little ones. As the estate website declare "Families visit time and time again to enjoy building sandcastles on the beach, paddling with their fishing nets, picnics and barbecues beside the river. Explore the enchanted woodlands and riverside path, play ball games or simply run around and burn off steam in the vast open spaces". Next time we come, and I am sure we will, there will be more adventures to find and enjoy. 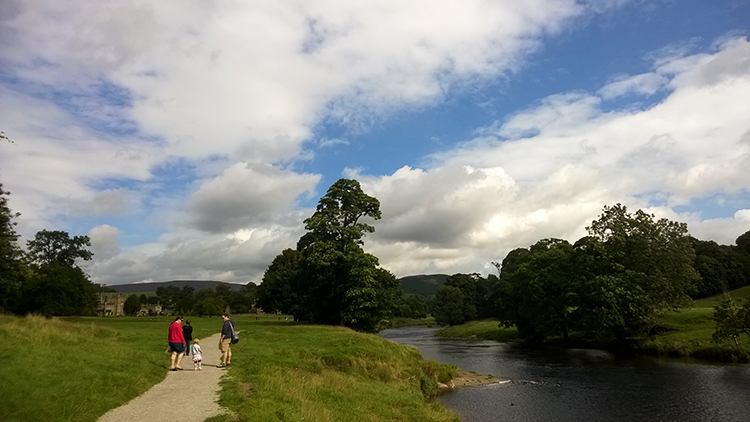 Our walk ended as it had begun, at Bolton Abbey Station. 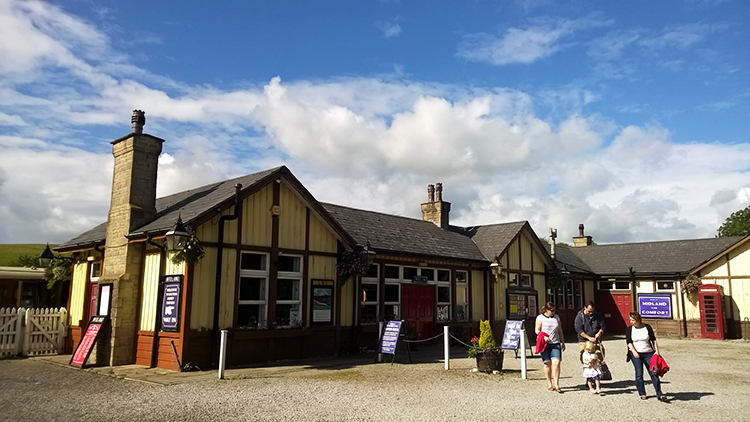 We had 30 minutes to wait for the train which was perfect and entirely planned so we could enjoy a light mid afternoon tea in the station cafe. The cafe and a small shop next to the eating area were very retro and very interesting. After browsing the shop we went out onto the platform and waited for our train to steam in which it did at the due time. No British Rail delays here, the line workers had the train arrive perfectly to time. 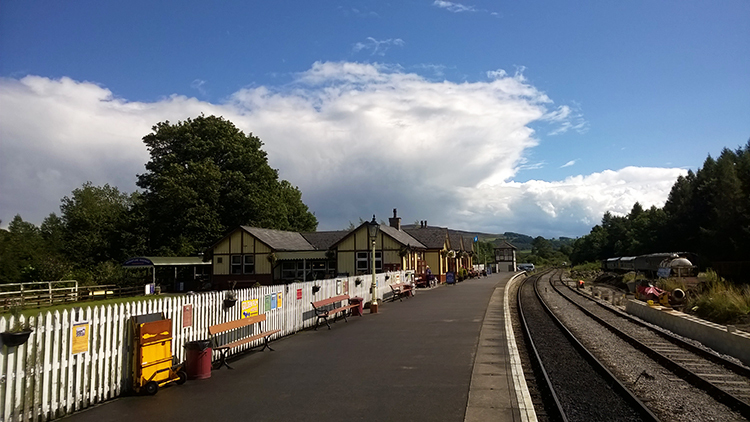 And the short train journey back to Embsay was the perfect end to a lovely day out. Try it yourselves.